I just want to write it. It makes me laugh and that’s the most important thing. … I fished out a bizarre newspaper cutting I’ve had for twenty years. It was in the Daily Express. ‘The Boy In The Coffin – Mystery of Man in Milton Keynes’. This guy had jumped off the bridge into the canal and they had found him floating in a standing position, and they had no idea as to his identity. In his pocket they found a wood shaving, a bus ticket, and an old film. They dried out the film and when they played it back it showed him as a young boy in scenes with a coffin. First they show him lying down in the coffin, then he gets out and this thing swings towards his head, swings across the screen; then there’s the doll’s head being smashed, squashed tomatoes... all very ritualistic. They found a ring in the water as well with the initials BR. That linked him to a family in Swindon who had always practised black magic, and the sons – one went missing, one was murdered, and one died in suspicious circumstances. … and now twenty years on it’s haunting me again. I’ve collected ﬁve hundred and sixty-four marbles. I’ve got one big one and I’ve got six medium sized ones and I’ve got four hundred little ones. I’ve got white ones with spotted different colours, blue ones, purple ones, two that are sky blue but one’s a light sky blue and one’s a dark sky blue and I’ve got an orange one with black spots and waves, a purple and white one that’s all wavy and a dark green and light green all mixed up together. I haven’t got a favourite; I like them all. It’s called My Secret Marbles because my friends always say it’s a bit weird so I don’t really tell them. I don’t like it when people say stuff is weird but I don’t really mind. Anyway, it is a bit weird because nobody else would probably do that. Maybe it’s because they’re not really into marbles, they’re into pencil cases and stuff, and they don’t realise how much fun it is if you haven’t got any brothers and sisters to play with at home and have something to do when you’re bored, instead of just sitting there watching TV or playing on your Nintendo all day long like I do sometimes. 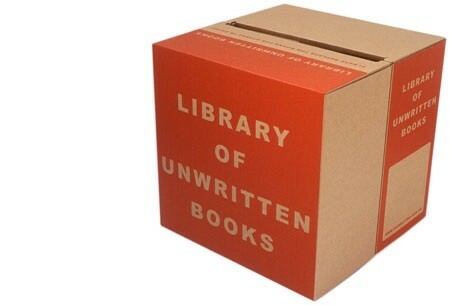 [Write the founders of this work in progress – an exploration of poiesis as a basic human capacity, even where unrealized]: “Library of Unwritten Books is a collection of possible books. Short interviews are recorded with people about a book they dream of writing or making. Limited edition mini books are published from transcripts of the interviews, which are made available to readers at exhibitions and special events. Touring book-boxes also display the books at everyday venues such as cafés, pubs, libraries and launderettes. The concept was inspired by a fictional book repository featured in The Abortion: An Historical Romance by Richard Brautigan. The novella’s main protagonist is a librarian who catalogues any book deposited in his care.